Spain’s new government has acknowledged its human rights obligations by ending the exclusion of undocumented migrants from health care, an austerity measure that was adopted by the former government and which claimed several lives. During times of economic crisis, dismantling economic and social rights is a regular feature of fiscal consolidation measures, one which results in increased inequality and poverty in the most vulnerable communities. While some have questioned the effectiveness of human rights in confronting these extreme inequalities and other structural socioeconomic injustices, a recent victory gained after an ongoing struggle by various Spanish civil society organizations supported by the Center for Economic and Social Rights (CESR) shows that there is cause for hope. Working for six years with organizations like Médicos del Mundo, Red Acoge and Amnesty International Spain, we have gathered evidence, proposed reforms and denounced the injustice of fiscal austerity policies before international human rights bodies. One of the harshest austerity measures adopted by the former Spanish government during this time was Royal Decree Law 16 of 2012, which excluded undocumented migrants from receiving any publicly funded healthcare. The new Spanish government recently heeded civil society’s arguments and issued Royal Decree Law (RDL) 7 of 2018, re-establishing universal access to healthcare. This measure was ratified by Congress on September 6, 2018. CESR and a coalition of Spanish civil society organizations have raised this argument on several occasions before a number of international human rights bodies and procedures, which recommended the Spanish state re-establish the universality of its healthcare system. By issuing RDL 7/2018, the government agrees to guarantee universality of care and complies with legally binding international treaties signed by the Spanish state. The new RDL also states that Spain's austerity measures were based on exclusively economic criteria aimed at reducing the public sector financial deficit and on mostly short-term arguments that, having not been evaluated, “did not demonstrate improved efficiency in healthcare.” As such, the previous regulations “failed to legally guarantee the right balance between the need to ensure the financial sustainability of public healthcare and the inarguable requirement to effectively provide the right to healthcare to all persons.” As a corrective, RDL 7/2018 was the result of a consultation process between the government and Spanish civil society, which CESR supported. The return of universal access to health care in Spain, without distinction or discrimination and regardless of a person’s administrative or migratory status, is taking place at nearly the same time as another historic decision by the UN Human Rights Committee. With Nell Toussaint vs. Canada, the Social Rights Advocacy Center challenged the Canadian government’s life-threatening denial of health coverage for an undocumented migrant and the Committee confirmed that “as a minimum, States parties have the obligation to provide access to existing healthcare services that are reasonably available and accessible when lack of access to the healthcare would expose a person to a reasonably foreseeable risk that can result in loss of life.” The Committee also declared that States cannot make a distinction, for the purposes of respecting and protecting the right to life, between regular and undocumented migrants. (paragraphs 11.3 and 11.7). Both decisions—one pertaining to policy and the other to the application of the law—are the result of the human rights movement’s persistent efforts to protect the health and life of undocumented migrants, one of the most vulnerable groups in terms of the human rights impacts of austerity and deficit measures. Although Spanish civil society groups acknowledge and celebrate the importance of the RDL reinstating universal healthcare access in Spain, they also emphasize the need to monitor its implementation, as a narrow interpretation of the law could result in the exclusion of certain groups, such as people of Roma origin or the parents of regular migrants arriving in Spain as the result of a family reunification process. For these reasons, CESR continues to support its partners' monitoring efforts and joins their demand that the government carry out an impact assessment of the effects of austerity measures on human rights in Spain over the last few years. 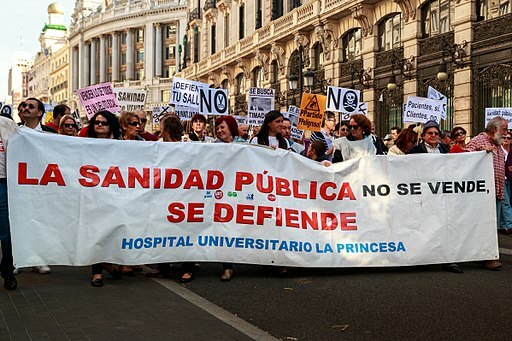 Image of Marea Blanca demonstration against health care privatization in Madrid, courtesy of Barcex.